Published Friday, May 29, 2009, OK personal/derivative use; link www.lovethatimage.com. I belong to a garden club, and my favorite part is that every three months, people get together and bring things they’ve grown that are beautiful. I find them irresistable to photograph. 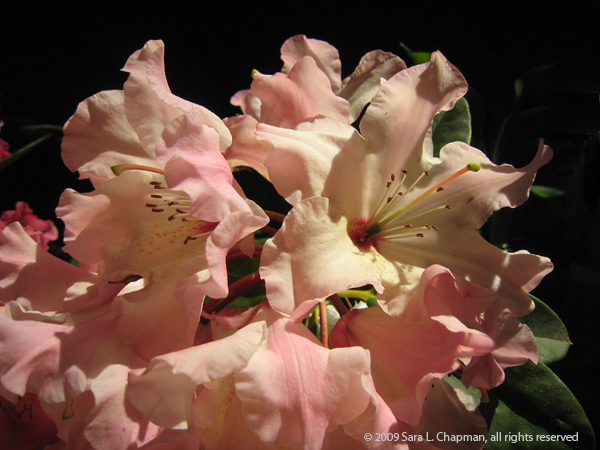 Here’s a sprig of azaleas, oops, now I see they are rhododendrons!, a peachy pink color that I am in love with. And if you’d like more pink, hie on over to Pink Saturday. This rhodie photo is one of my absolute faves, so I think I’ll include it for Shadow Shot Sunday and Flowers for Today, and what the heck, let’s go for Macro Monday while we’re on a roll. All those meme sites have super participation from talented photographers, so take a look. Hope you have a wonderful Pink Saturday!!!! Sara, I have added your link to my Pink Saturday list, and I am going to add you to my weekly reminder e-mail. I hope it will be helpful. Your photos are always fantastic, and this one is no exception. I love azaleas, and this shade of pink is so delicate and lovely. Thank you for joining with us. I hope you will enjoy. Welcome to Pink Saturday! Your photographs are amazing, I am in awe! I love beautiful Pink Blooms! Thank You for sharing your beautiful Pinks! I love your azeleas! Mine are gone but were so beautiful! Your pink is gorgeous! Happy Pink Saturday. So very beautiful!! Welcome and Happy Pink Saturday!! Love the lovely PINK flowers! The picture is beautiful! Very pretty! Welcome to Pink Saturdays!!! Have a wonderful week! Happy Pink Saturday! Your photo is beautiful. I, too, cannot resist photographing flowers. Happy Pink Saturday! Beautiful pink flowers!!! What a Beautiful photo!! Full of pinkness! Gorgeous photo! I’m always trying to improve my camera skills, so I’ll be back for more photographic eye candy! gorgeous subject and gorgeous photo. Happy Pink Saturday. What a lovely bloom…such a scrumptious color. Happy PS. this is tissue delicate beautiful. Thank you and Happy Pink Saturday to you all, also! Pink rocks! Happy Pink Saturday Birthday! Lovely blooms, fabulous photography! I hope I’m not too late to welcome you to Pink Saturdays. I love rhododendrons especially pink ones! lovely blooms.. happy pink saturday! Hi Sara and welcome to Pink Saturday! Your photo is beautiful and the bloom is just lovely. Thanks for stopping by! I’ve got about 5 pieces and they are all similar but none are marked the same. Must be just a popular pattern at one time. My pink cupcake plate I got 4 of and the guy I bought them from had the whole set and the plastic tote they were in collapsed and broke all but these 4. Made in japan is all I can read. They are lovely though, I bought them just to put the cupcakes on. Good luck with finding out what they are! Thanks for posting wonderful flowers! I thought that was a rhododendron! But then I have been told they are related, so I guess I was not too far away! Beautiful flowers anyhow – and a brilliant shot! Love the lighting! Pretty in pink! These azaleas are true beauties. Fabulous shot, beautiful colors, lighting and shadows! Doesn’t get any better than this! Happy SSS! lovely subtle shadows & Rhodie! It is a beautiful photo you have captured. The soft colours, its frilly petals and the different shades have come out very well of this exquisite flowers. What a beautiful photograph of gorgeous flowers! Happy 1st Pink Saturday, Sara! Beautiful rhodies and the are casting some nice shadows. Wow…wonderful photography!! I enjoyed your TF entry! Those are lovely blooms! I love that you can really see the details in this photo. Wow! Those are amazing flowers! Very very nice! Welcome to Pink Saturday! I love the color of your flowers, beautiful but understated. Happy PS! Thar really is a beautifully coloured Rhody.! So, you too think pink. What a gorgeous rhododendron! I wonder if it’s hardy enough for my climate. Probably not…but I can dream. Thank you all again for such enthusiastic comments. Really, I was just lucky on this one, but I am so happy it is giving us all such pleasure. beautiful close up of peach flowers. What pretty Azaleas! Love the delicate color! Pretty color, love pink flowers and this is a super photograph, especially like the dark background which really makes them stand out. Thank you very much for sharing them with Today’s Flowers. Just to let you know, I’ve seen this accidental dark background, that I like so much, before. 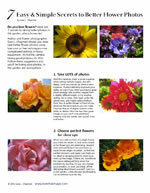 It comes from taking a closeup of a flower that’s in direct sunlight. Somehow the automatic exposure compensates so much for the super brightness of the light on the petals that it underexposes the background. Great shot and what a pretty pastel color.